Solar power is energy from the sun in the form of radiated heat and light. The sun’s radiant energy can be used to provide lighting and heat for buildings and to produce electricity most commonly in a conversion process know as photovoltaics (PV). Greengate Power is currently focused on developing PV solar projects in Alberta. Solar photovoltaic technology uses solar cells to convert sunlight directly into electricity. When light from the sun (photons) strike the semiconductor surface (usually silicon) of a solar cell, it releases a current of electrons collected by conductive wires and exported to the power grid. This process releases no greenhouse gas emissions into the atmosphere and provides clean electricity to consumers whenever the sun is shining. Canada’s use of solar energy has increased in recent years, although it remains relatively small in terms of market penetration. Currently solar makes up less than 1% of Canadian electricity production. The potential for solar energy varies depending on location. Available sunlight is typically lower in coastal areas, due to increased cloud coverage, and is higher in arid central regions like the Canadian prairies. In general Alberta has some of the best solar resources in Canada. Solar power may be one of the most benign ways of generating electricity. 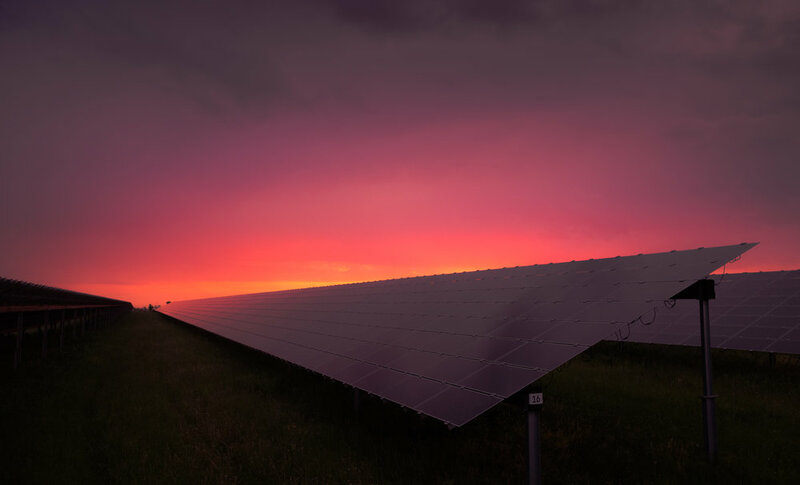 Solar power facilities reduce the environmental impacts of burning fossil fuel for power generation, such as impacts from green house gases and air polluting emissions. Like any other large industrial facility solar projects do have an impact on the existing landscape like displacing cultivated or grazing lands.